You know we love running, but were you also aware that we’re big fans of graphic novels too? Imagine our delight when we discovered that the two are not mutually exclusive. ‘The Murder Mile’ by Paul Collicutt is a murder mystery set amid the intense rivalry of the battle to run the first 4-minute mile. Paul kindly took time out of his busy schedule to answer some questions for us about his work, his running and his future plans. To be in with a chance of winning a copy, enter our easy-peasy Murder Mile giveaway. If you’re desperate to get your hands on a copy right away, you can buy it here on Amazon. We know you’re a keen runner. Which came first: the running or the writing about it? Running. 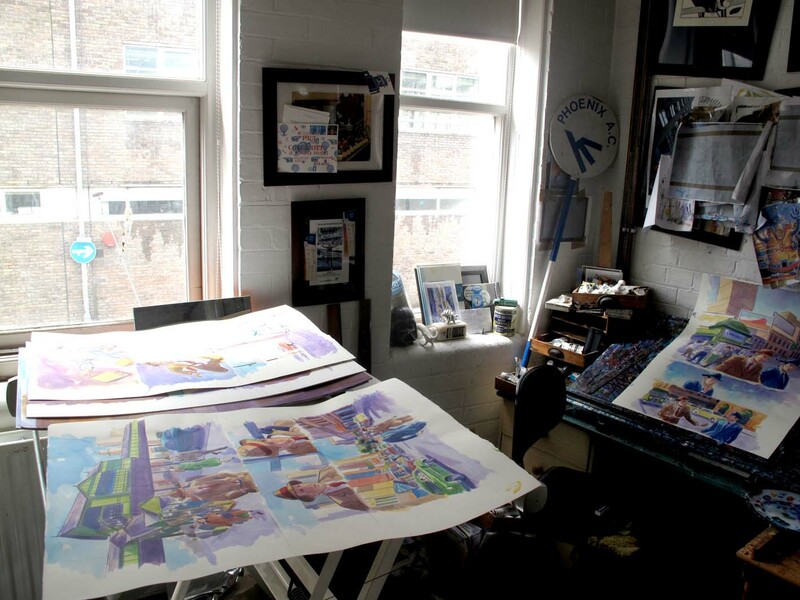 I ran seriously from the sixth form onwards… I joined Phoenix AC when I came to Brighton to do my degree in Graphics Illustration at the Art College. Not only did I end up being taught partly by the Illustrator/ Author Raymond Briggs but I also ended up training with the Olympic Champion for my event ( Steve Ovett ). When I was starting out as an illustrator I did a cartoon strip for Athletics Today and also for Athletes World. Both of these have since folded…not I hope due to paying me! I’d actually tried to avoid doing projects related to running for a while …wanting to keep them as separate strands I my life I guess……seems bonkers now I look back on it! Having eventually decided to mesh my two passions together it turned out to be an obvious fit. The Murder Mile is both graphic novel and murder mystery. Why did you decide to combine the two genres? I love both genres. There are quite a few murder mystery graphic novels out there and they always seem to me to work really well to me. The story is set around the time of the first 4-minute mile. What was it about that particular running story that appealed to you? It’s about achievement and challenge and being the best in the world. I know Bannister and Landy’s times are surpassed with ease these days but I always think that you could pluck the great runners out of history and put them in the modern day and they’d rise to the challenge. The fact that there were three people from three different continents who had three different approaches to breaking four minutes was a great and thrilling story I always thought. Were there any real-life intrigues that helped to shape the story is it all your own pure fiction/creative genius? The races, apart from the one with Sydney Wooderson in are all real. The dramas they created themselves were great and I didn’t want to tinker with them out of respect. It was the image of Bannister passing Landy in the Commonwealth games Mile final that sparked off the entire story for me. Landy had lead off at World record pace…heroic in his fortitude and Bannister had followed behind gambling on his own more calculated pace, also heroic in his determination to stick to his plan. With just over 100m to go Bannister catches Landy and sweeps by on the outside whilst Landy glances inwards….don’t ask me why but I thought ” What if something distracted him?….something like a gunshot?” From there my mind started building stories around the race. I probably should have gone for a long run to stop thinking about it all! I wanted there to be some mystery plot revolving around athletics. At the time in 1954 drugs were not an issue but taking money in what was meant to be an amateur sport was something that was frowned upon. I felt the story had to revolve around money and betting in athletics. Your illustrations – watercolours, we think – are gorgeous. 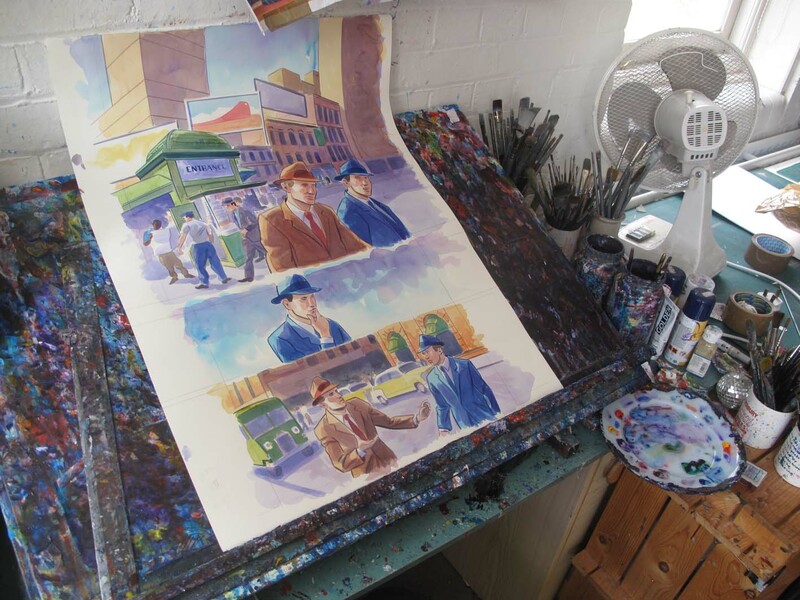 They’re very unusual for a graphic novel though; much more ‘painterly’ than most books of this kind. What prompted you to choose this particular approach? Madness! Because it almost killed me doing them. I have always thought that we don’t need to limit ourselves to how we approach graphic novels. Back in the 1960s Jack “King” Kirby used to experiment and put collages into his artwork pages on mainstream titles like The Fantastic Four. He was thinking ahead…I don’t think he saw limits to how we approach telling stories in graphic novel formats. My background is as an illustrator and my style has always been a bit painterly with strong colours and lighting. I’d done some graphic novels for young readers for Templar Publishing called “Robot City Adventures” and I’d taken a more traditional black line approach with digital colouring. I knew that I wanted to try something else and I thought the challenge of painting an entire book would be interesting. 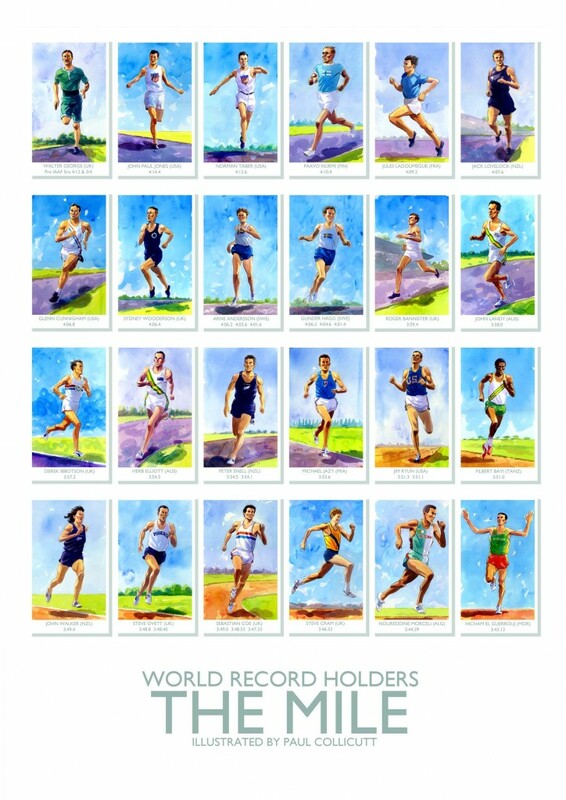 You say in your lovely, lively blog that you’re working on a poster of all the men who’ve held the world record for the mile. What are the plans for the poster when it’s ready? Well, it’s going to be used to help promote the book. The Commonwealth Games organisers are also interested in it as they are looking for things related to the Games to put in their shops next year in Glasgow. I’d also like to sell it as just a poster and I have plans for ones on the Men’s and Women’s Marathon World Record Holders. There are lots of great women’s running stories too that don’t get much coverage. Do you have any plans to celebrate amazing female runners too? I would love to do something about women running the Marathon. Just as the image of Bannister flashing past Landy in the Miracle Mile fascinated me so does the one of Katherine Switzer running the Boston Marathon in 1967…race officials are trying to force her out of the race but other runners are protecting her…she got to finish but the one other woman who ran ( who’d run it the year before ) Roberta Gibb was forced off the course before the finish line. I coach athletes and I coach both Male and Female athletes and I think it is truly remarkable to think that the Female Athletes would have not been able to run in the Olympic Marathon as recently as 1980. So…yes if I can find the right angle that is an area I’d like to explore. We love a good graphic novel. What are your future publishing plans? Currently I’m working on some more Robot City material for Templar Publishing as well as developing some new picture book ideas for them. I’m also putting together a proposal for another book with Self Made Hero who have been great to work with. I love getting out on the Sussex Downs or running through forest trails. Wherever it is I always have this fantasy that I’m running in some big race and I’m streets ahead…or challenging for the front….well I do until someone passes me and I have to reset the running fantasy all over again. In your bio in The Murder Mile, you say you use friends and family as models for the characters in the book. Please can we be in the next one?! You sure can! I’ll hold you both to that!